Welcome to #ShowAndTellSunday! Have a project, piece of art, recipe or whatever you've been working on this week that you'd like to share with the rest of the class? Now's your time to show off! Post it in the comments or link to your work with a sentence or more about the project. Oh and what is that dairy-based monstrosity pictured at the top, you ask? 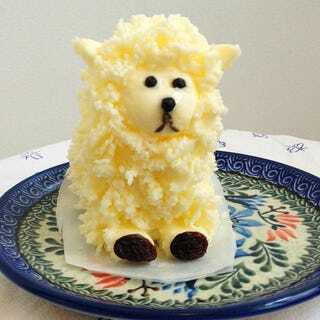 Every year I'm forced to carve a sacrificial butter lamb for Easter or face familial disappointment. The deliciously flavored golden idol above is this year's effort.